Here in our city, we live on a street that is a prime conduit for zooming rush-hour traffic attempting to avoid congestion. The phenomenon is called rat running, and we have some pretty fast rats. We yell at the drivers, we write letters to the City, we try to organize our neighbors, but the street racing drags on (pun intended). We have even thought of sitting at the end of the driveway with Amy’s hairdryer, ala a very funny clip we saw not too long ago, hoping to put the fear of radar into our adversaries. As we sip our morning coffee, it is not uncommon to observe cut-through commandos with gas pedals mashed to the floor, roaring by us in a Muybridge-like blur (Muybridge was an early photo master in depicting motion). For us to try and combat this nonsense with what is euphemistically called traffic calming, we would need 70 percent of our neighbors to agree with us. This in a city where the kar is king – tough math, and especially with a handful of absentee landlords. So no speed bumps or speed tables for us. And our suggestion – to allow parking on both sides of our narrow (24’ wide curb to curb – I measured) residential street at all times instead of alternate evenings – will surely never fly in our city of convenience. Who knows – maybe even the Fire Chief (Fire Chiefs design most of our cities these days. We wouldn’t want to have to redesign their equipment, would we?) would get cranky…. And it’s not just our street, in our neighborhood, where this is a problem. Residential streets and neighborhoods are bad, and even main drags are bad as we rush from work to home, from home to work. Every year hundreds of pedestrians and bicyclists collide with these speeding dinosaurs, and often this causes injury, (and sometimes mortal wounds), to the less armored. I know whereof I speak – I got nailed not long ago by a giant pickup truck. To make matters worse, our block is nearly 1,000 feet long. Many here are much longer – much more than a quarter mile (dragstrip). There is plenty of time to get up a full head of steam – we think 60 mph or more is often the case. As I was reflecting on this unpleasant conundrum I consulted our City Code. I was wondering what it said about street widths and parking arrangements for a street such as ours. And what did I discover? That the Code (Chapter 128, Article IV, section 128-7, Paragraph 9 – I am sure my nomenclature is wrong, but you can find it if you look) specifies “In general, block lengths shall not exceed 1,200 feet or be less than 500 feet.” WHAT??!? As if speeding weren’t bad enough! All over the city we have these unendingly long blocks. Long blocks make for all kinds of problems in creating a lively, permeable, fine-grained urban fabric – there is quite a literature on this subject. 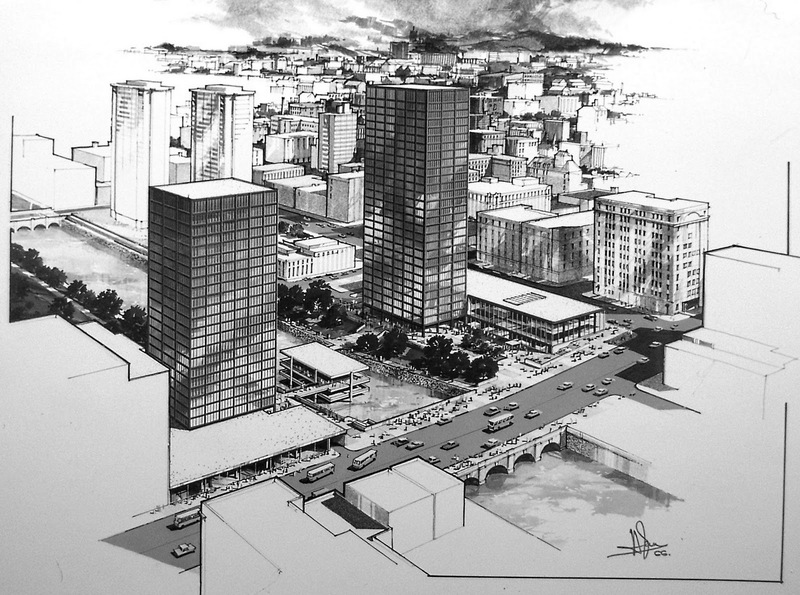 The biggest urban blocks that get diagrammed frequently are in Salt Lake City – 600 feet square. We got ‘em beat. I have written here before about the problems with our city’s grid of streets, and our blocks without alleys. Even without hurtling cars, this poses all kinds of problems throughout our city. Add the speed demons and it’s good reason to stay on the sidewalk, or the front porch. Or the backyard. Rat running and our city grid: a one-two combo of punches. We did get the city to post yellow “SLOW DOWN” strips signs on a few light posts, but that has had exactly no impact on the speeding. And hoping for fewer cars on city streets any time soon is truly a fantasy. Perhaps autonomous cars will make a difference…. In the meanwhile, speaking of backyards, one of our neighbors is cooking up what may be a terrific new approach. Ugh. Somehow, we seem incapable of naming any important planning or design initiative anything other than ROC. ROC is the airport code for Rochester. Must we really persist in this ROC title for our restaurants, bars, carpet cleaners, dry cleaners, home inspectors, car repair shops, bagel shops, theaters, barber shops, moving companies?… And urban design plans? Anyway, the Governor of New York has threatened to provide our city with tens of millions of dollars ($50 million) to transform the Genesee River, which runs through our city, into the asset that it should be, and could be. The City’s ‘plan’ for the money involves spending most of it on maintenance that should be undertaken anyway, like repairing and redesigning very bad riverside plazas (with parking underneath: let’s get rid of all parking along the river – all of it) created during “urban renewal”, fixing terraces and paving at public facilities alongside the river, or repairing the now pedestrian-only Pont de Rennes bridge, which crosses the river at High Falls and offers sensational views of the city’s greatest natural asset (it needs to be fixed – it’s rusting!). Oh, and there is a plan to re-water the aqueduct that once carried the Erie Canal through our downtown. Really expensive ($35 million?!?). This is, for me, way down the list of things we need to do right away. The place to begin, it seems to me, is to create a real plan. This would include tasks and costs, as in the city’s shopping list, and then move on to priorities, phases, and methods of implementation. 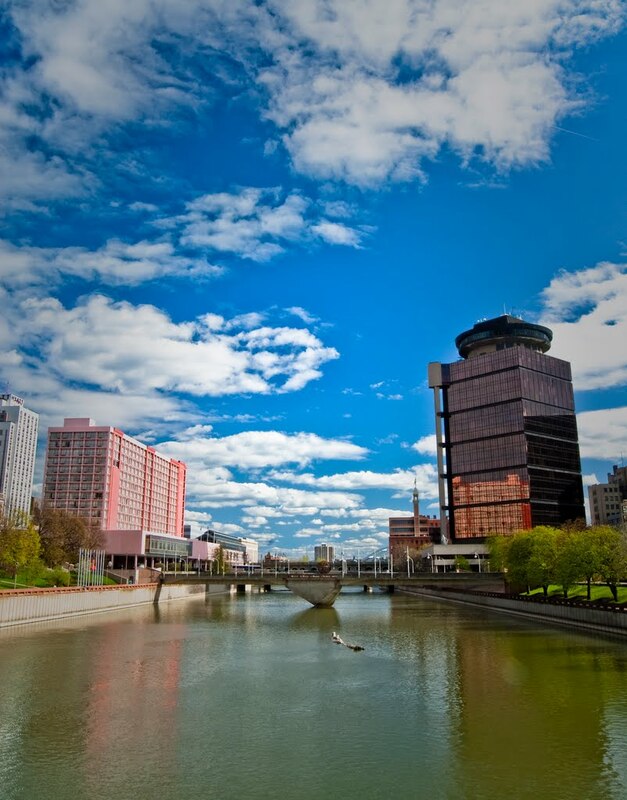 Our river runs through downtown, and the return on investment there could be quite substantial. But our river runs through the rest of the city as well, past University and neighborhoods, parks and other waterfalls, wetlands and marshes, marinas and boat clubs, all the way out to Lake Ontario. Connect both sides of the river continuously for public use, from Lake Ontario some 8 miles to the north, to as far south as money and jurisdictional power will take us. (I am told that the only way to do this is to redo the aqueduct. I say Nuts to that). Invest in the waterfall and its High Falls District, which lies at the heart of our city, and our city’s history, and support programs which educate, celebrate and redevelop this central stage of our community. (Full disclosure: I am on the board of Greentopia, and we are proposing that this place, and our first-in-New-York-State Eco-District, get some help in this ROC thing). 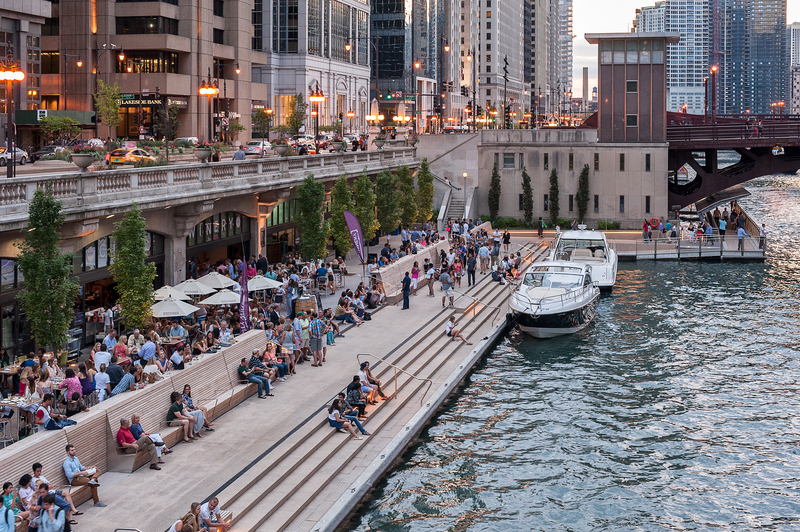 Make the river in our downtown the magnet for citizens, businesses and adjacent redevelopment that other cities – Chicago, Milwaukee, Denver, Grand Rapids, others – have succeeded in achieving. This would mean $100s of millions in increased value, jobs, and tax revenues if done properly. Downtown river development has worked real wonders in other cities, like Columbus, Ohio, or Greenville, South Carolina. That’s it. Three tasks. If we did these three, perhaps we could go from ROC to Rochester. Wouldn’t that be nice? My brother Doug and I got into a discussion of blocks and alleys and urbanism on this Thanksgiving Day. He writes quite wonderfully about his neighborhood in Portland, Oregon: Alameda. You can find his work here: www.alamedahistory.org. Well, of course he is exactly correct. 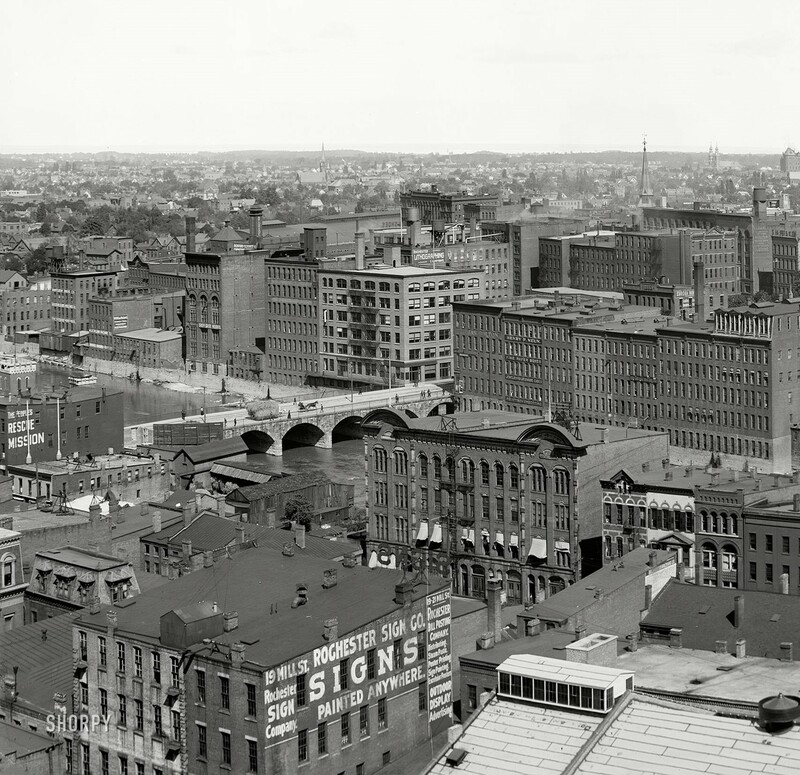 As the incidence of car ownership rose – and it did so really fast – the alley disappeared, developers platted lots back-to-back, and the American city block became just a bit poorer for the change. 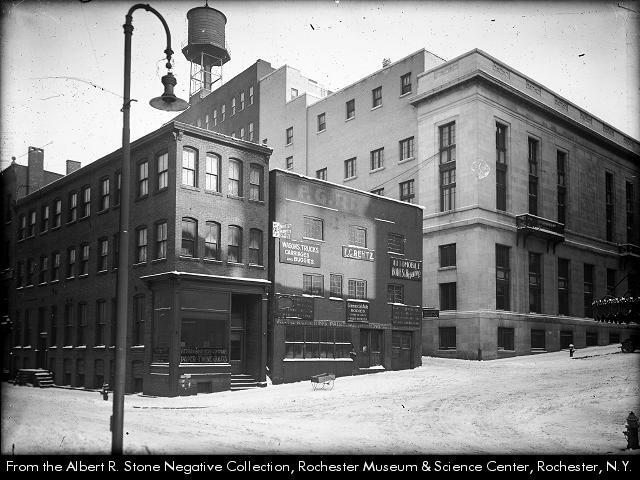 Here in Rochester we had 4,000 cars in about 1912, and 40,000 cars less than 10 years later. Simultaneously as the 19 teens unfolded, we had 250′ deep blocks, some of which ran/run on for over 1,500′ as the nascent city took shape.. A real urban mess. Why a mess? Well long thin blocks means less access, of course less walkability and permeability, eventually less security, and certainly a crimp in urban mobility, whatever your means of locomotion. Interestingly, it is not that hard to find developers saying, in the early years of the century of the car, that automobiles belonged in front of the house, not at the rear, like horses and carriages. Harrumph. The gold standard for the American city block form, in my view, is the Chicago block (okay, I am a Chicagoan, but still….). 660′ long, and 350′ deep, from the center of the rights-of-way. This gives you 125’ deep lots, a nice alley, and useable streets. But similar conventional urban forms can be found in other cities. Even where the urban block form is very large – Salt Lake City comes to mind – there are internal means of movement, which if not alleys, are at least byways that promote some kind of porosity. Not sure what they were looking at when they did Chicago (it was probably the Loop, where the block form is anomalous), but this is a pretty good summary. 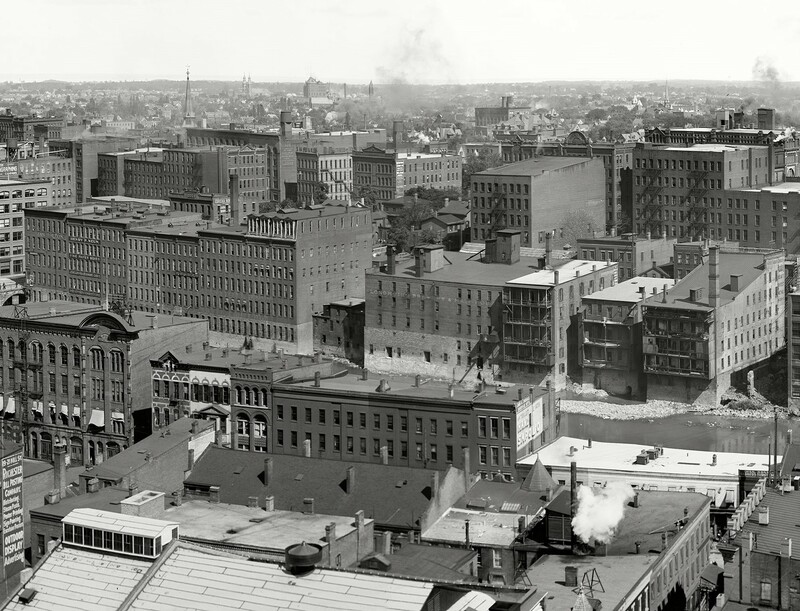 In the end though, the sketches, and this entire conversation, beg a few really simple questions: where did the alley come from anyway, how did it work in various urban morphologies, when did it go away (always in the 1910s? ), and what were the consequences? 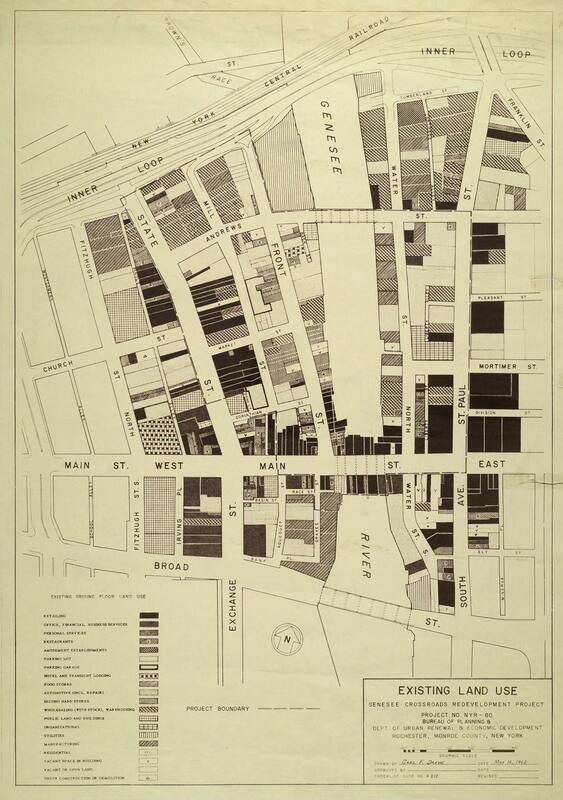 I would have thought that someone would have written a history of the American city block, and the alley. Not so, that I can find. Maybe you can suggest sources. Any ideas? Meanwhile on North Water Street…. Once upon a time, North Water was a district that featured garment manufacturers, technology innovators, shoe makers, brewers and distillers, warehousers, and more than a few squatters. From Main Street, North Water proceeded to Central Avenue and the railroads. Most, though not all, of the buildings on the river side of the street were large masonry loft buildings, housing manufacture and warehousing for retail. 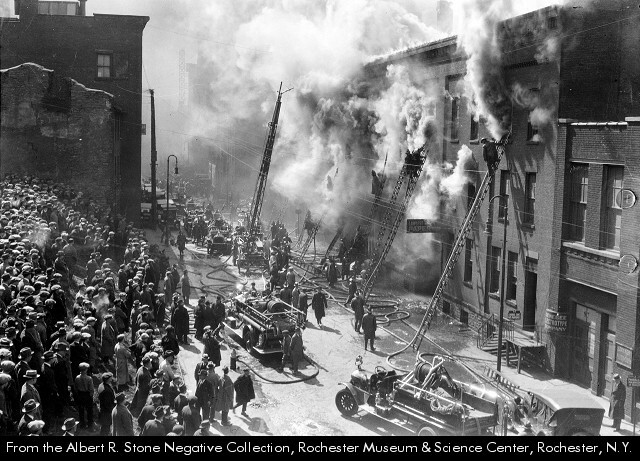 In April of 1924, the Lawless Paper Company had a huge fire, and crowds gathered to gawk. Lawless Paper burns, April of 1924. Note the house on the left side of the street, behind the crowds. That’s Marie Lappitano’s. 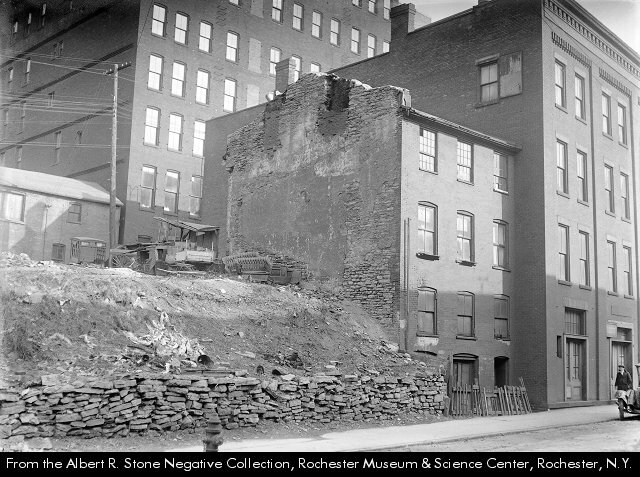 And many of the buildings on the east side of the street – opposite the river side – were small, older, residential, and mostly removed, like the Marie Lappitano house at 88 North Water above, built in 1865 and about to vanish, in this view from 1922. The house disappeared by 1926 or so. Here’s a map from 1962 that shows what Water Street and Front Street were like just moments before they disappeared into the jaws of urban renewal. (Thanks to M. Denker for this plan). Above, the Tishman proposal, and below, the I.M. Pei proposal. Photo from Panoramio by Soxrule 19181. Our work lies before us. 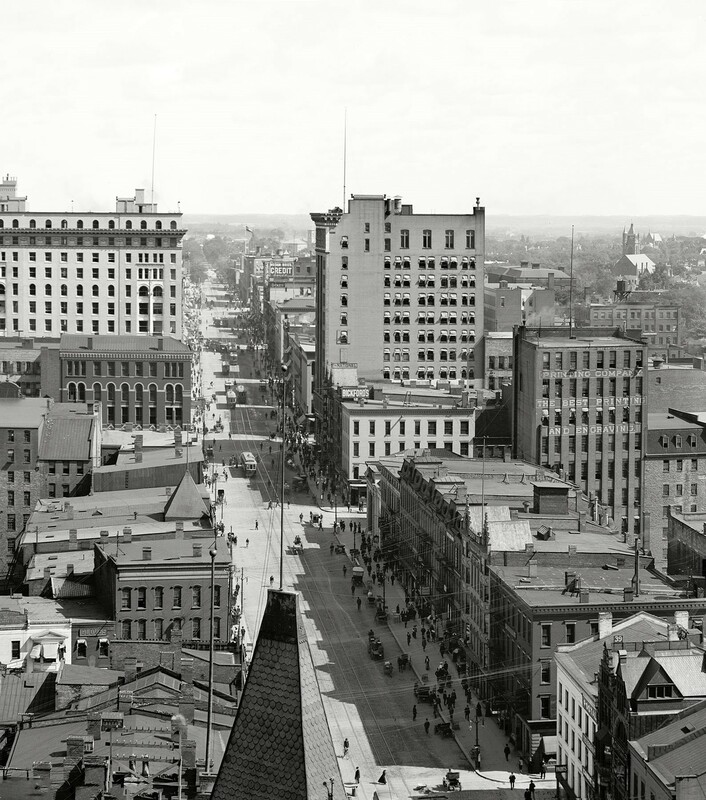 If we can keep images of the rich and historic life that was Water and Front Streets in our imaginations, and if we can be cheered by what’s possible, we can make a better city.